This recipe was created by lack of other food items available in our refrigerator when I was in school. I have made it ever since and is especially popular with my nieces and nephews. It is very simple to make and makes great leftovers. This is especially great in the summer! Cook and drain linguine. Let pasta cool. Once pasta has cooled then place in serving container and pour 1/2 of the bottle of Italian dressing over pasta and add onion, season salt, Old Bay Seasoning and toss until mixed well. Then chop 1/2 of cucumber slices and mix. 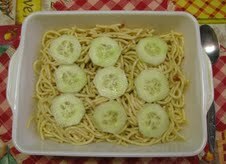 Then add remaining bottle of over pasta and top with sliced cucumbers and sprinkle Seasoning Salt over the top for a dash of color. Helpful Hint: To prepare this salad ahead of time I cook the linguine noodles, rinse and let cool and place in an airtight container until ready to serve so all I have to do is add the remaining ingredients and it is ready to serve.